Rabbits, do not fear us. We only need big hugs. Steiff EAN 070129 Fuxy Fox, 25cm. 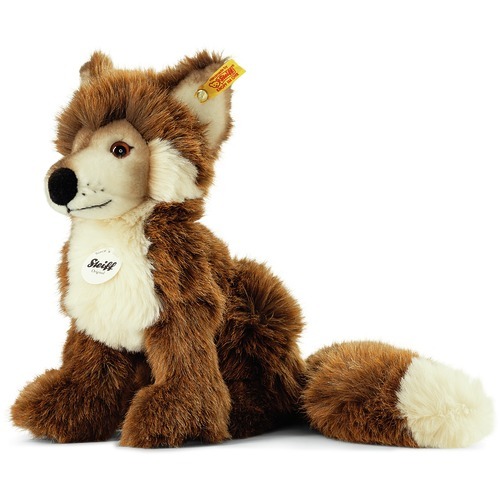 Fuxy Fox is made of cuddly soft brown and white woven fur with airbrush details. He is stuffed with synthetic filling material and has safety eyes. Fuxy is machine washable at 30 degree C and has the CE mark for safe toys. <?xml:namespace prefix = "o" /> Fuxy has a brass plated "button in Ear"
Steiff EAN 045097 Posh Pattern Pets Phil Fox, 28cm. Phil is made of rust/cream high quality cotton. He has safety eyes and is stuffed with synthetic filling material. He is machine washable at 30° C, suitcase not washable, and has the CE mark for safe toys. He has a stainless steel “Button in Ear”. Steiff EAN 069291 Foxy fox, 23cm.